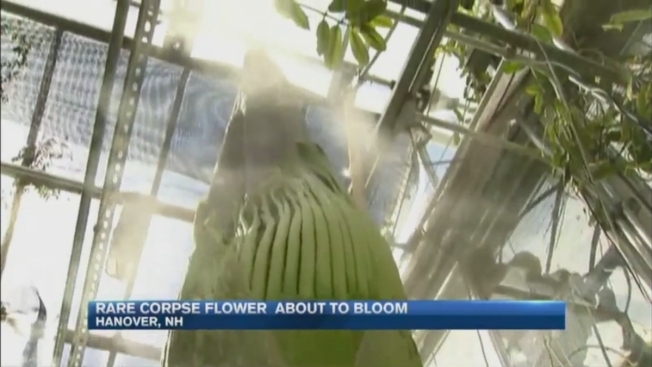 A rare "corpse plant" is about to flower at Dartmouth College in Hanover, New Hampshire. "It's been fun," said Kim DeLong, Dartmouth's greenhouse manager. "I love seeing all the enthusiasm this has generated on campus and in the community." Dartmouth named its 7-foot-tall corpse plant "Morphy," taken from part of the plant's Latin name. The species is among the world's largest and rarest flowering plants. It is native to tropical regions of Asia, like Sumatra, and blooms just once every six years or so, DeLong explained. When the corpse flower is in bloom, a spectacle which lasts for only a few short days, it emits an odor that can be shocking to the nose. "A dead body, roadkill, feces, urine, garbage, all together," DeLong said, describing the smell of the corpse flower. "Yeah, it's pretty bad." The last time Morphy's dark burgundy flower unfurled was back in June, 2011. The plant's foul odor, in the wild, is meant to attract flies and beetles to help pollination, DeLong said. At Dartmouth, it's people who are now being lured by anticipation of the impending bloom. "I think it's just the beauty of the natural world," Bob Tyrrell of Somersworth, New Hampshire said of the plant's allure as he visited it inside the Dartmouth College greenhouse. "Something that's gross to us is a way of life for something else. It's incredible!" "Particularly at this time, when there are so many difficult things in the world, to have so many people come to visit a plant to see it flowering is very exciting news to me," said Toni Hover of South Royalton, Vermont, who also came to see Morphy Thursday. DeLong said Dartmouth plans to hand-pollinate the plant and offer its seeds to other institutions. She said she hopes to spread knowledge about this giant, which is challenged in nature by deforestation. DeLong's best guess as to when the bloom will happen is sometime early next week, but of course, when that happens is up to the plant, not its human admirers. The Dartmouth College greenhouse is open to the public, and is free to visit. For more information on Morphy, including how to watch a web cam of the plant, visit this website.